05:22:00 Makes 12 servings, 1 piece (88 g) each. Makes 12 servings, 1 piece (88 g) each. Wow your guests with this gorgeous-looking twist on cheesecake. Heat oven to 350°F. Cook 1 cup sugar in small heavy saucepan on medium heat 10 to 12 min. or until sugar is deep golden brown. Pour into 9-inch round baking pan. Blend milk and cream cheese in blender until smooth. Add remaining sugar, eggs and chocolate; blend well. Pour over caramel sauce in pan; place in larger shallow pan. Add enough water to larger pan to come halfway up side of smaller pan. Bake 1 hour or until knife inserted 1 inch from edge comes out clean. Remove flan from water bath; place on wire rack. Cool completely. Refrigerate 4 hours. To unmold, run knife around edge of flan; invert onto plate. Remove pan. To soften any remaining caramel in pan, dip bottom of pan in hot water; spoon caramel over flan. To add a simple chocolate garnish, melt 2 additional chocolate squares. Use to make 2-inch square crisscross pattern on waxed paper. Repeat for desired number of lattice garnishes. Refrigerate 20 min. or until firm. Peel off waxed paper. 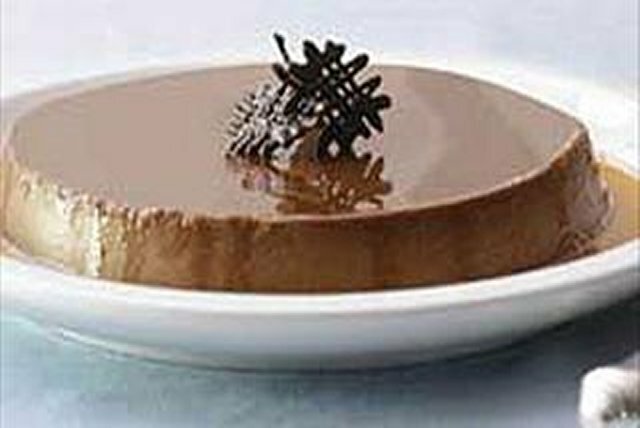 Garnish flan with chocolate decorations just before serving. To prepare caramel sauce in the microwave, mix 1 cup sugar, 1/2 cup water and 1/4 tsp. cream of tartar in 1-L microwaveable glass measuring cup. Microwave on HIGH 12 to 15 min. or until sauce is golden brown, stirring every 5 min. Pour into baking pan and continue as directed. Bake in 1.4- L cassarole instead of the baking pan. Serving Size Makes 12 servings, 1 piece (88 g) each.